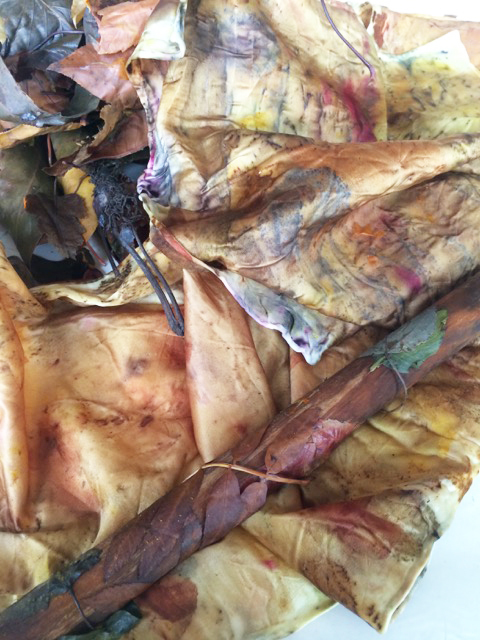 If you’re looking for a fun creative way to help the winter pass come make two beautiful Eco Print silk scarves.You will be digging through containers of specific dried leaves, a few dried flowers and other plant material. The leaves are soaked and or sprayed with tannins,vinegar and more. The last steps will be rolling into bundles tightly over dowels and tied under pressure then cooked/ steamed. No experience needed but the excitement of not knowing exactly what you will get , random fun. DATE: Sat, Feb 24, 10-3pm. COST: $125.00 includes everything.